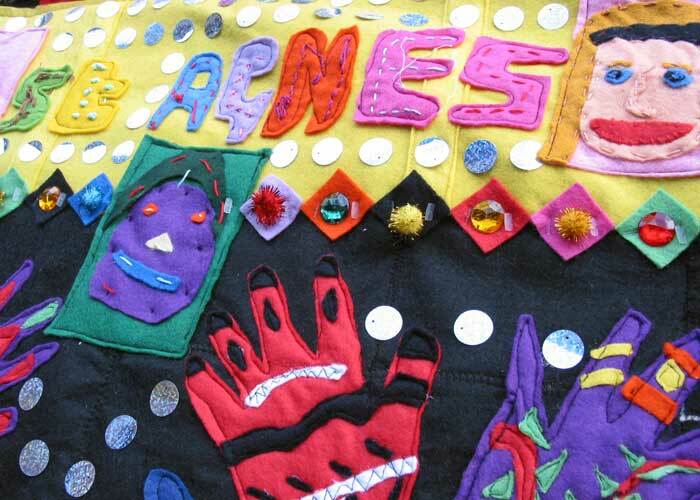 My School and Community projects use arts and crafts to engage people creatively, break down barriers to participation, inspire and contribute to curriculum learning, personal and community development. 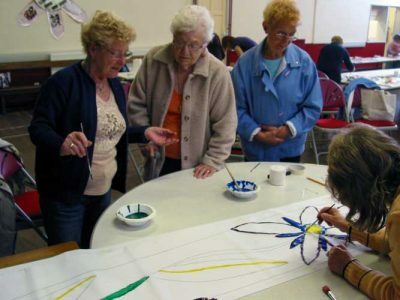 I am a creative artist with wide ranging skills. 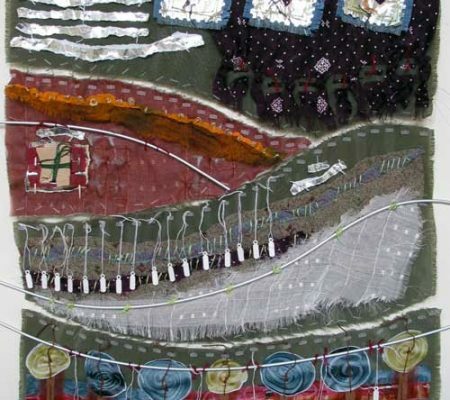 I specialise in Hand-stitched textiles; Banners and Flags; and have also completed many other projects using wood, stone, glass and metal. 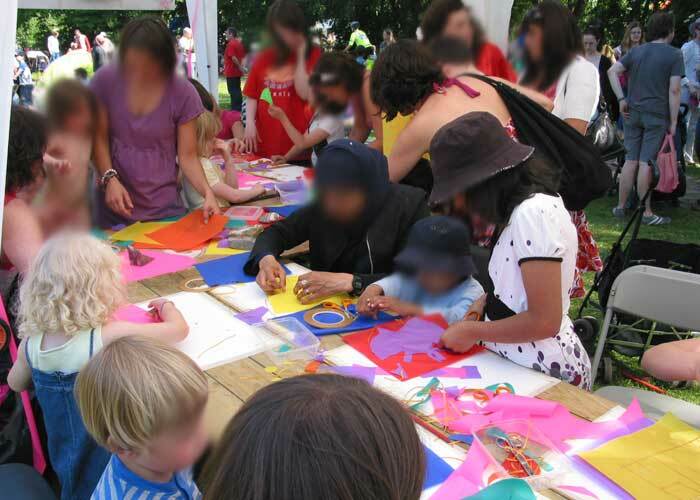 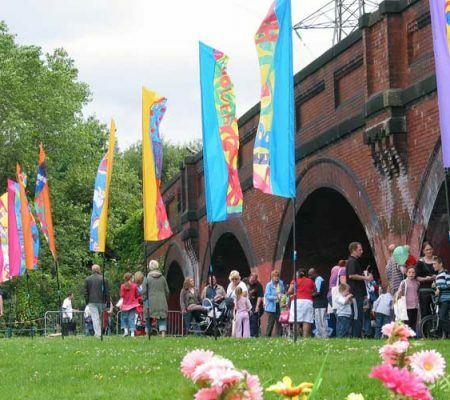 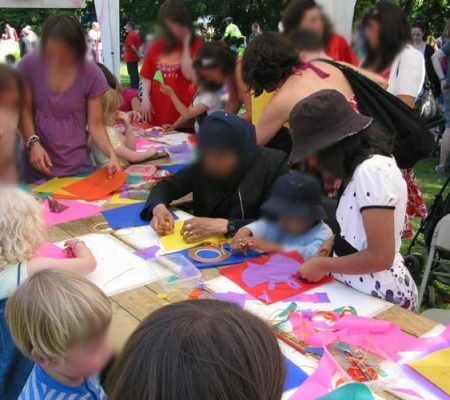 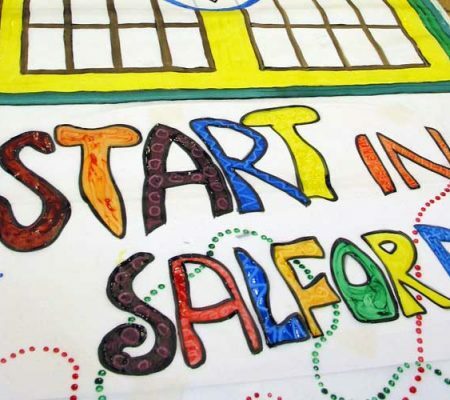 I have over 30 years experience of delivering primary school and secondary school-based education, community and participatory arts workshops with diverse communities across Greater Manchester, Lancashire and Cheshire. 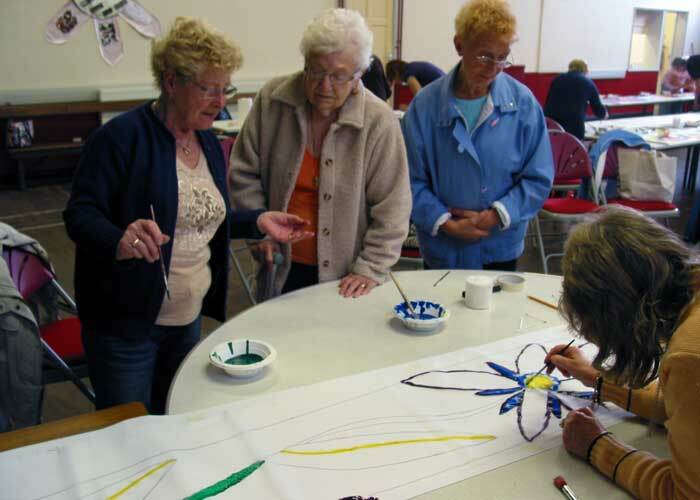 I work with all age groups and ability levels with a focus on enabling, inspiring and empowering the individuals I work with. 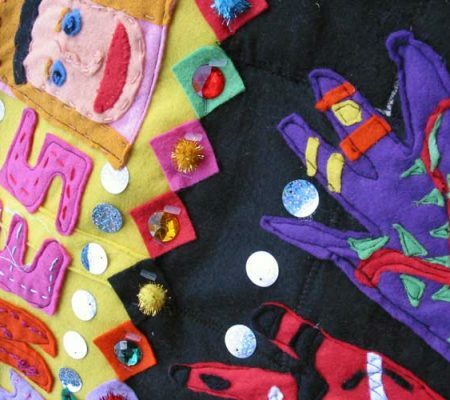 I have a fully inclusive approach to all workshops delivered with primary and secondary aged school children; and with young people, families and adults within community settings. 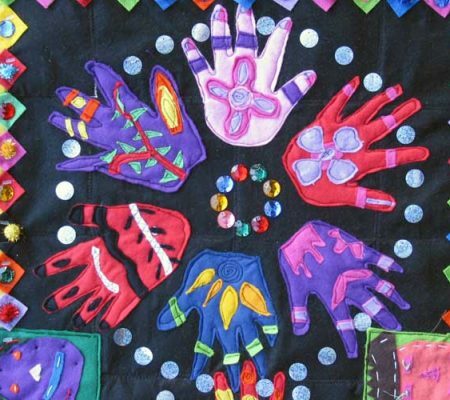 I fully support Diversity and do my utmost to remove any barriers to participation that may exist for workshop participants. 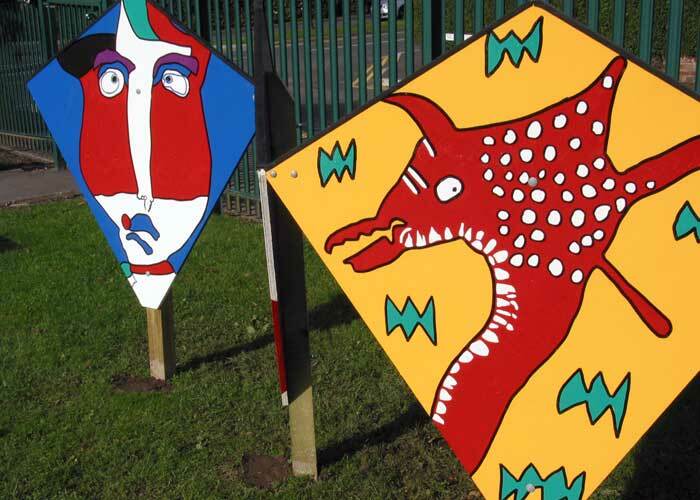 I am a qualified Arts Award adviser and teacher (QTLS). 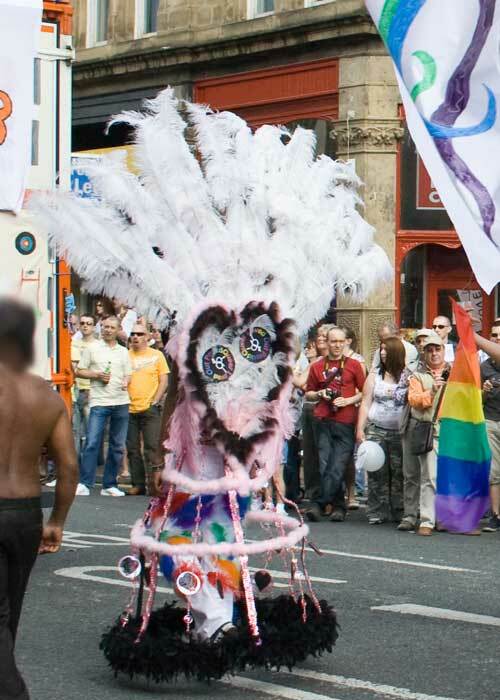 I have public liability insurance and enhanced DBS. 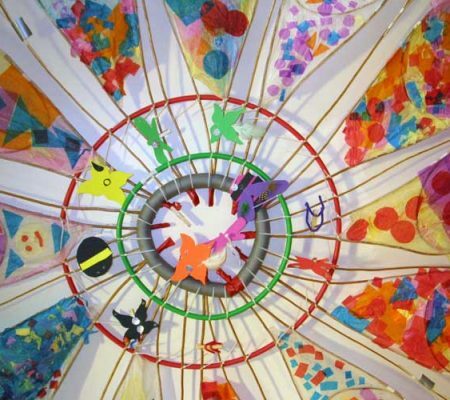 I am a highly experienced project manager + workshop leader used to delivering workshops to whole class groups in Primary schools across KS2, and secondary schools across KS 3 + 4. 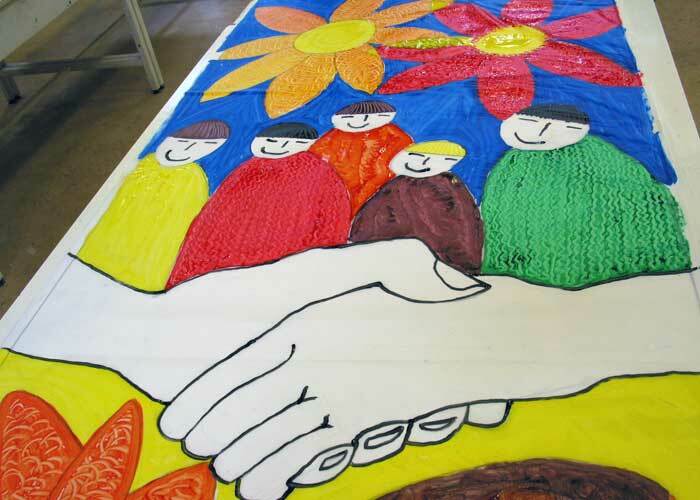 I am experienced at engaging a wide range of participants including SEND students, highly able, and those struggling to engage. 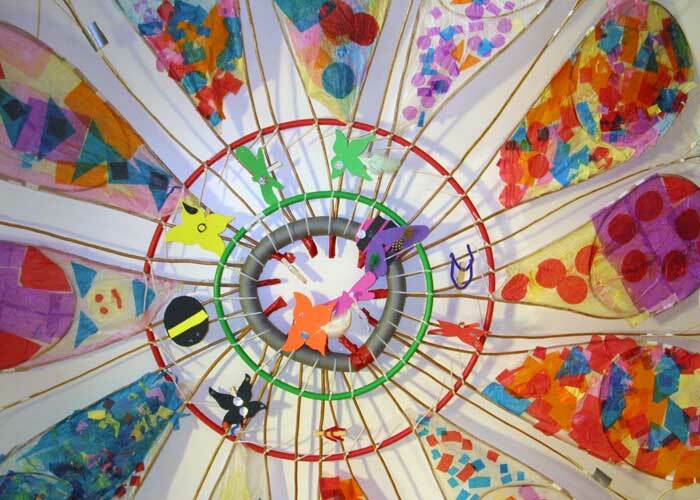 I am able to plan bespoke projects around your needs or suggest tried and tested projects guaranteed to engage and inspire. 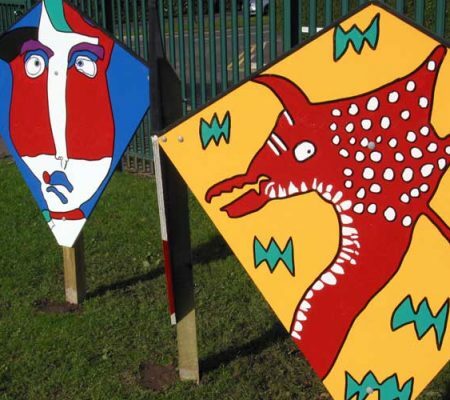 I am flexible, adaptable and knowledgeable of school timetables and constraints. 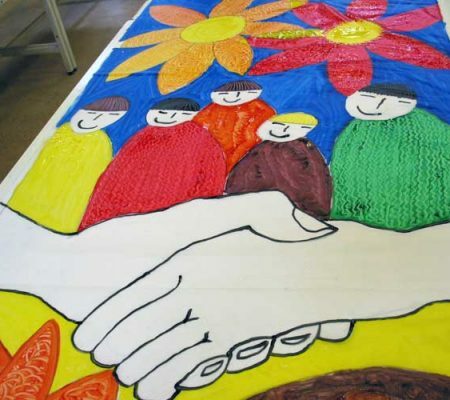 I celebrate and embrace diversity, and am experienced in delivering projects designed to broker interfaith, generational and cultural understanding to build harmonious communities. 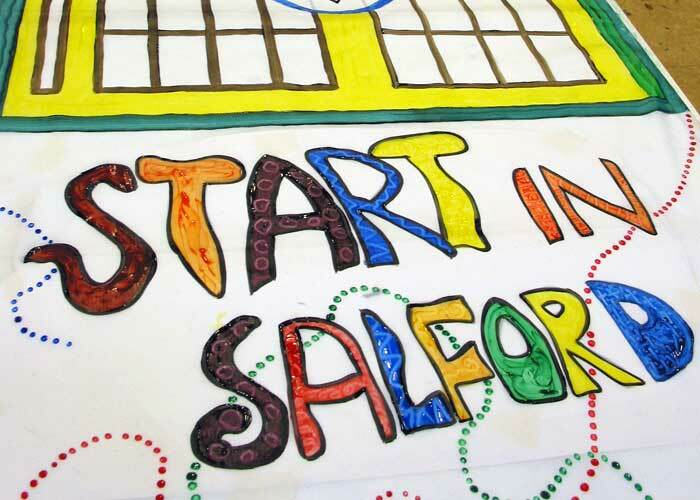 A community textile flag and banner making project with Start in Salford who commissioned me to work with their service users to create 3 stunning 5m high banners for the organisation to use on community open days and other celebratory days at their stunning centre. 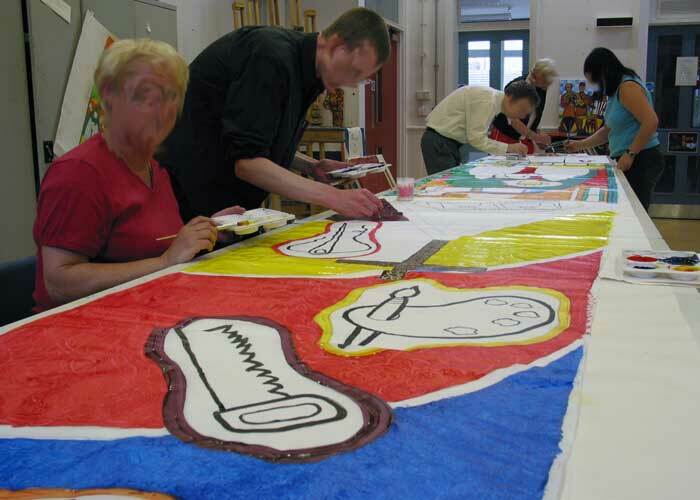 I delivered participatory design and painting workshops with a dedicated group of service users. 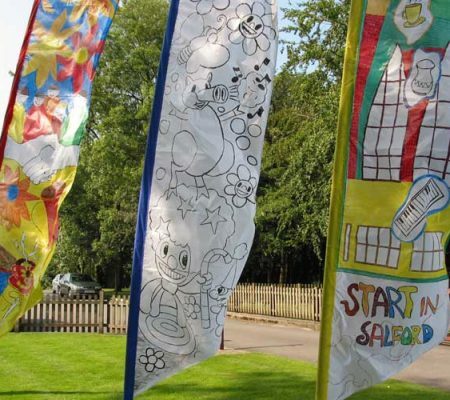 The participants chose the themes and designs for each of the sail banners. 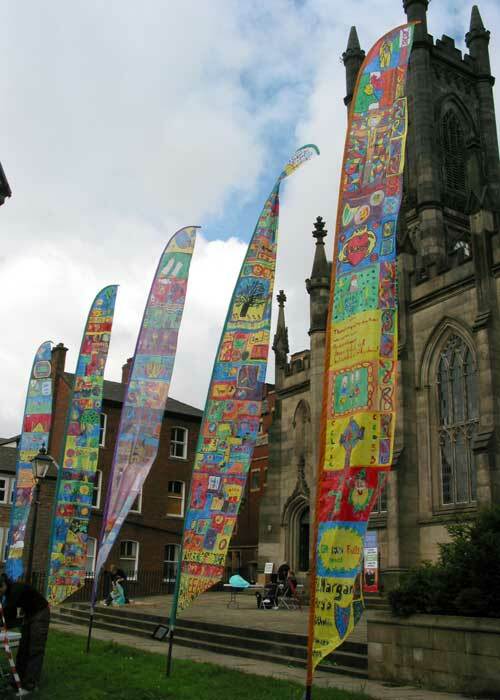 The sail banners were hand-painted and sewn together by the textile group. 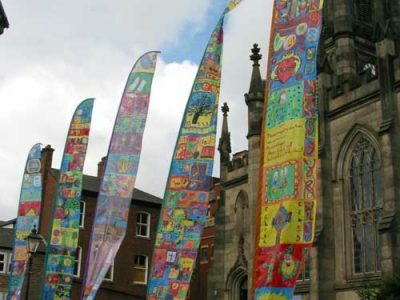 The sail banners create a stunning spectacle and celebrate the activities and vision of Start in Salford. 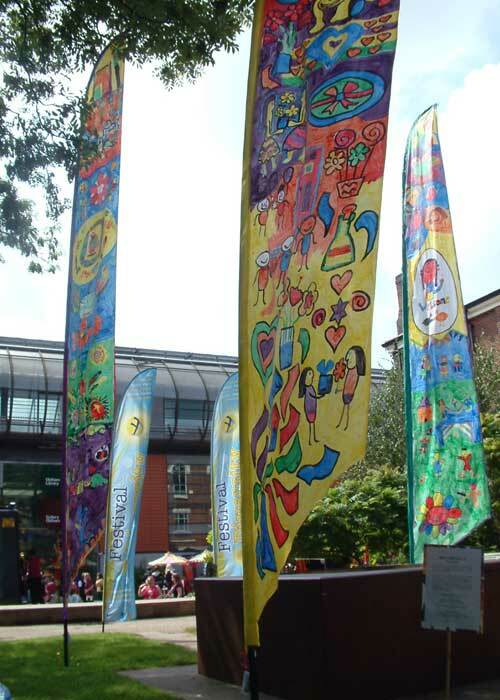 A primary school flag and banner making project for Manchester City council who commissioned me to work with an inner city primary school to create a series of 5m high sail banners as a celebration of the local community with its rich cultural diversity. 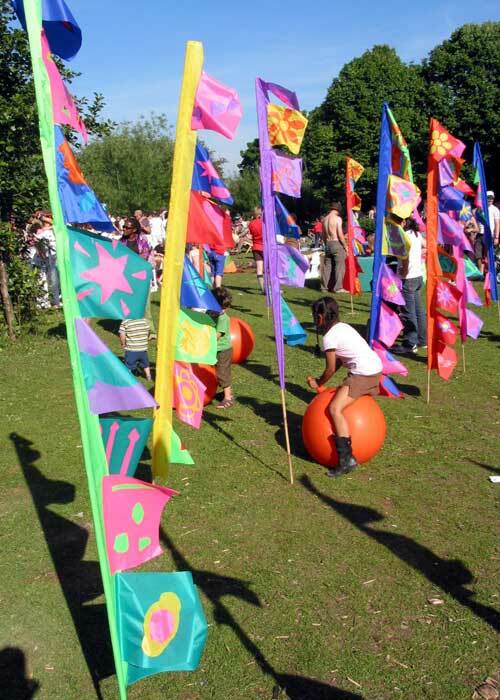 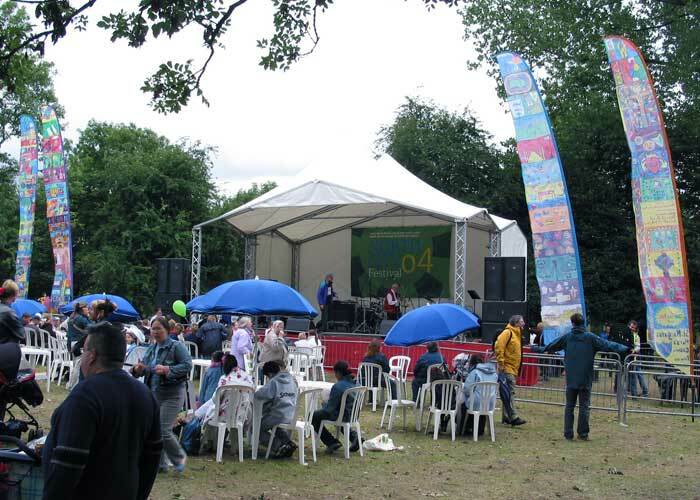 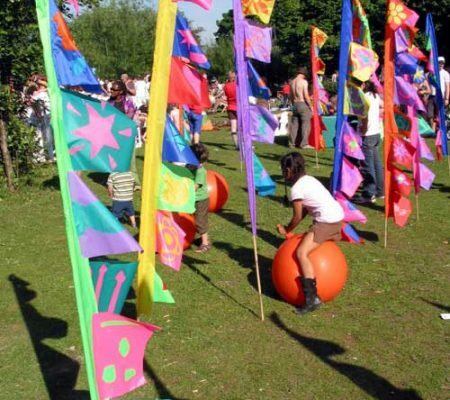 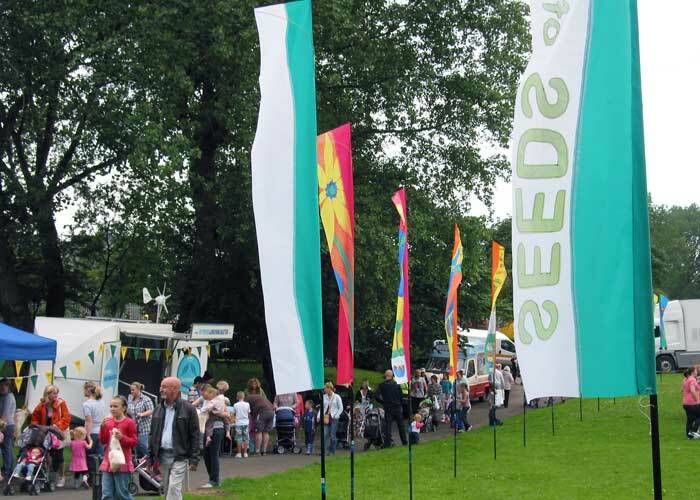 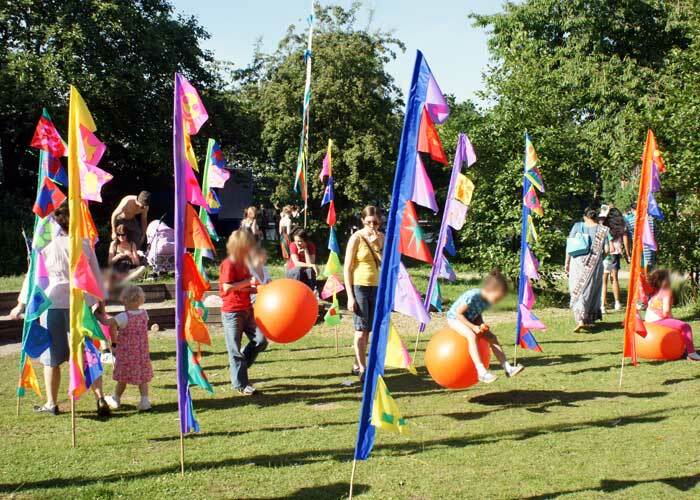 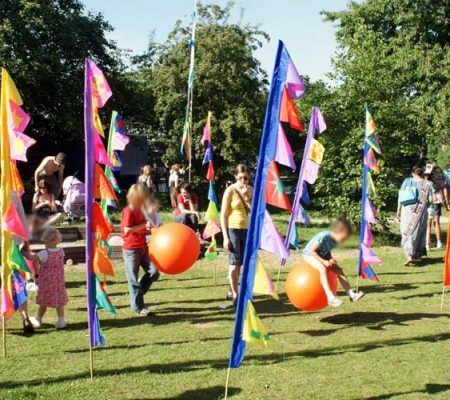 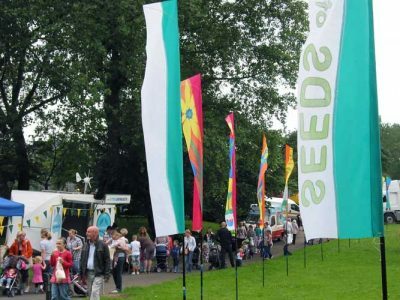 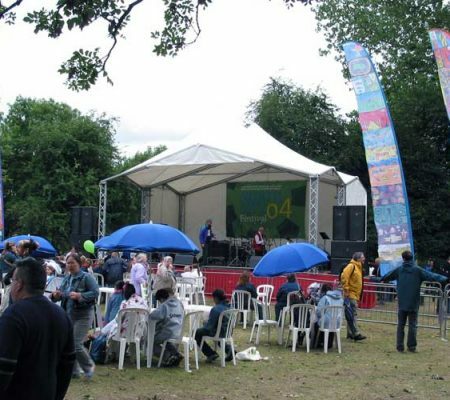 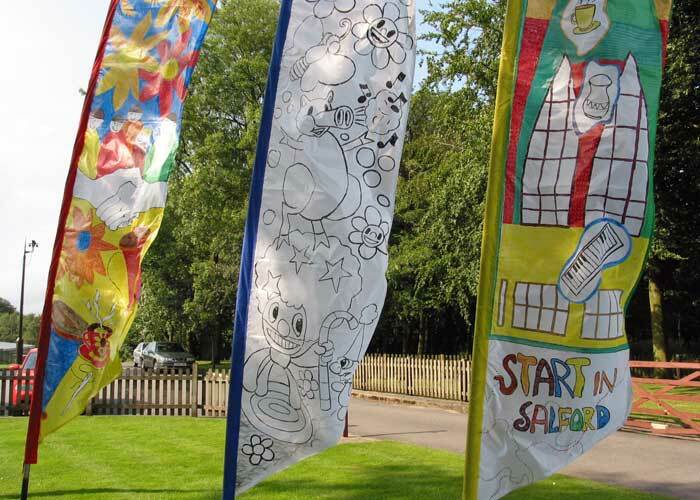 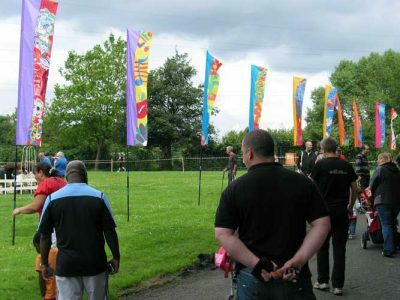 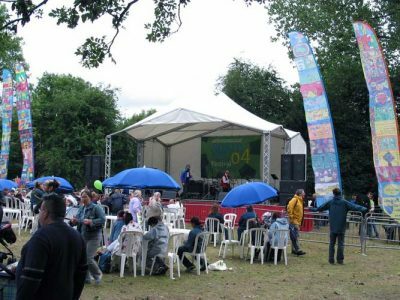 The sail banners continue to delight as they are used at community festivals and school events on an ongoing basis. 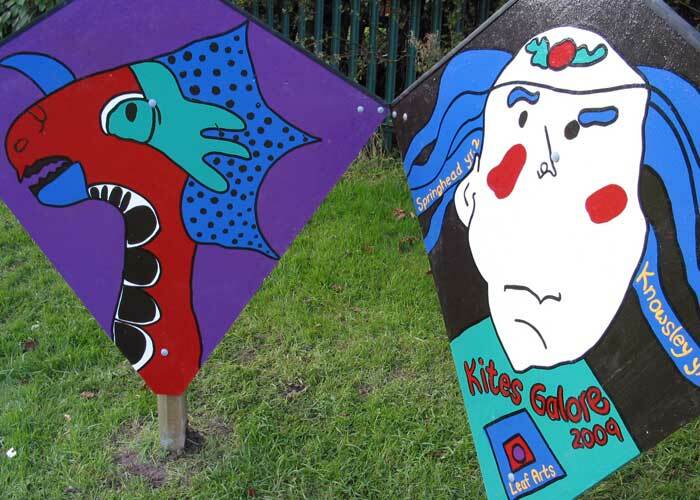 I worked with year’s 4 and 5 on drawing and design workshops before the final hand painting stage which brought their designs and ideas to a vibrant conclusion. 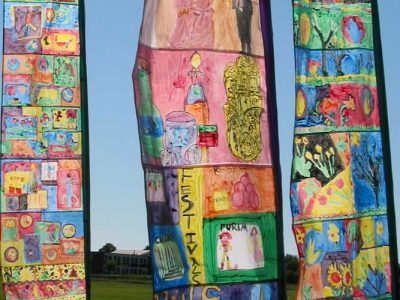 The sail banners are a celebration of everything the children value and enjoy about living in a culturally rich and diverse community. 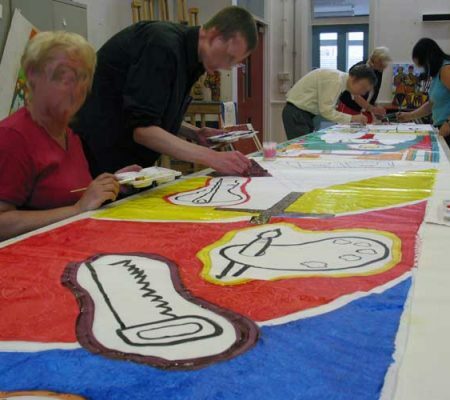 A secondary school and community hand painted textile flag and banner making project for Manchester City council who commissioned me to work with 3 different groups (high school pupils, a housing association group, community group of elderly residents) to create 25 sail banners for their annual community festival. 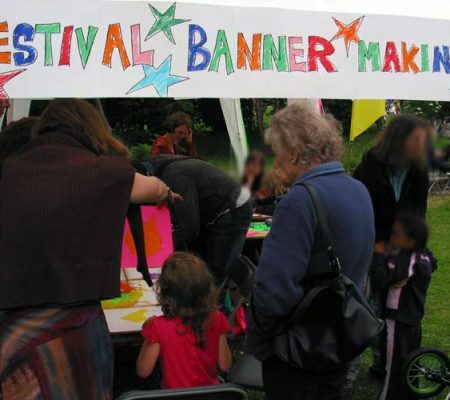 I delivered participatory design and textile painting workshops at different venues giving the participants the opportunity to put their own ideas onto the banners. 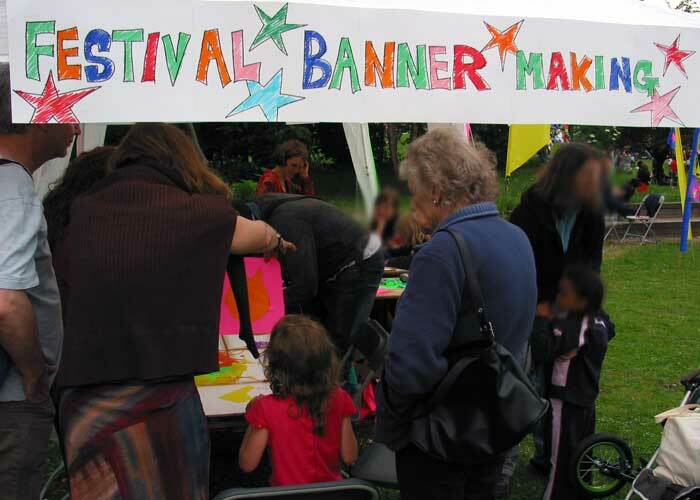 The banners were finally sewn together in my studio and where enjoyed by members of the public on each annual community festival. 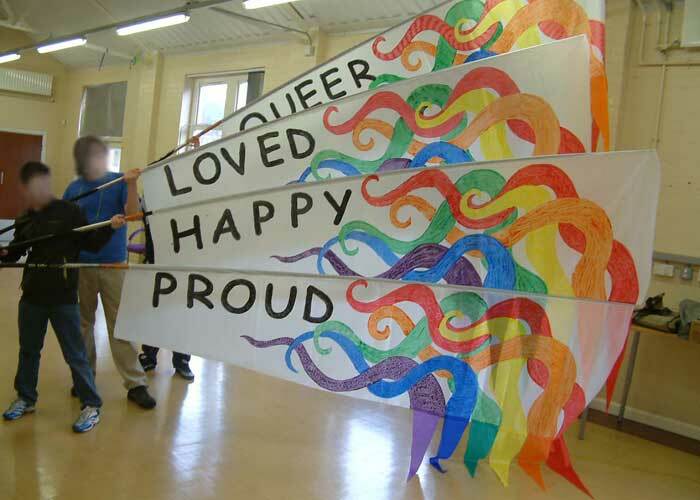 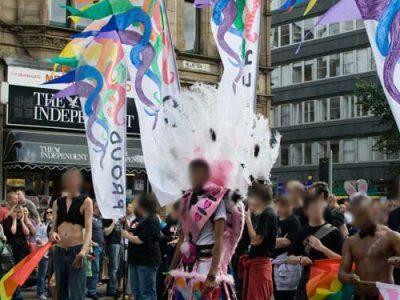 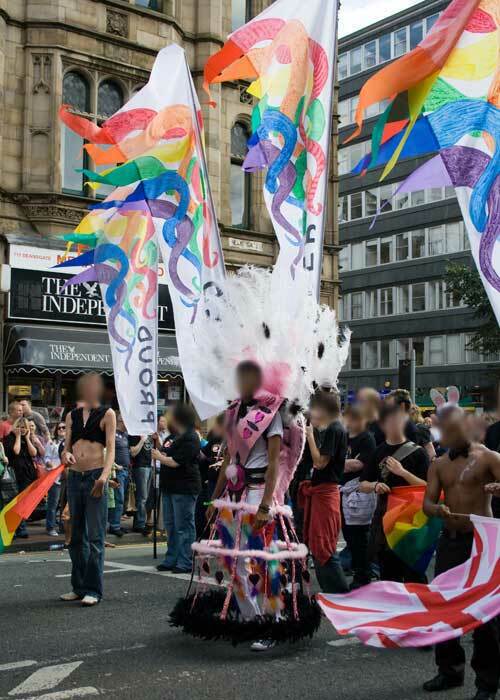 A young persons banner and arts project for Lancashire Youth Service who commissioned me to work with the Rawtenstall LGBT youth group to help prepare them for joining in with the Manchester LGBT community at the Manchester Pride parade. 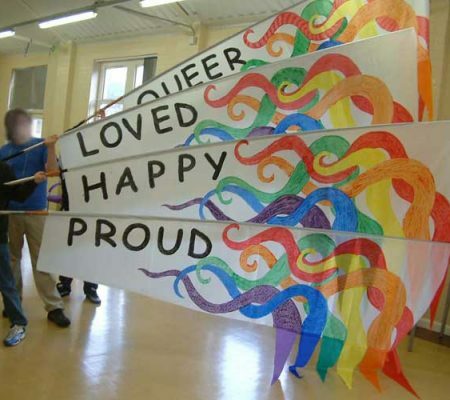 I delivered a number of workshops to create a costume for the groups leader to wear and these banners for the rest of the group to carry when they took part in the Manchester Pride parade and flew the flag for Rawtenstall’s LGBT community with pride. 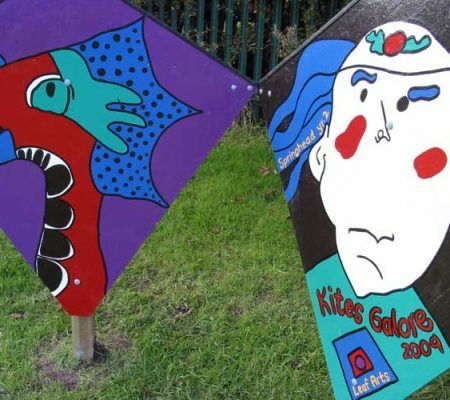 I supported the young people through the participatory design and making workshops to ensure they took ownership of the artwork and felt empowered through the realisation of their own ideas. 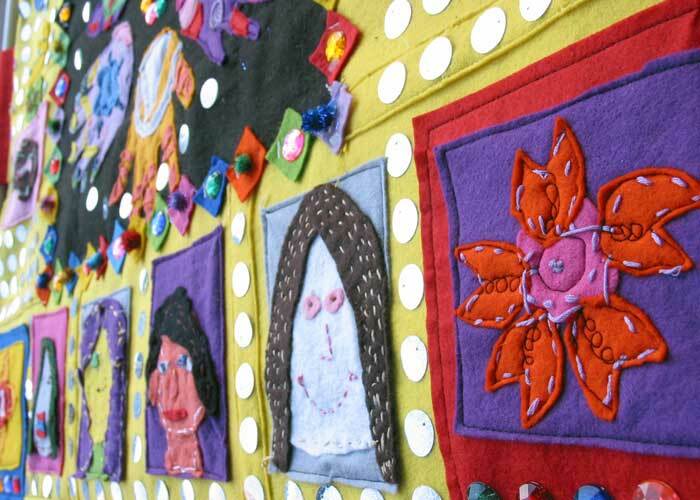 A primary school hand stitched textile and arts project for Oldham LEA who commissioned me to work with year 4 pupils at St Agnes primary school to design and create a textile wall hanging to celebrate their community links with a school in India. 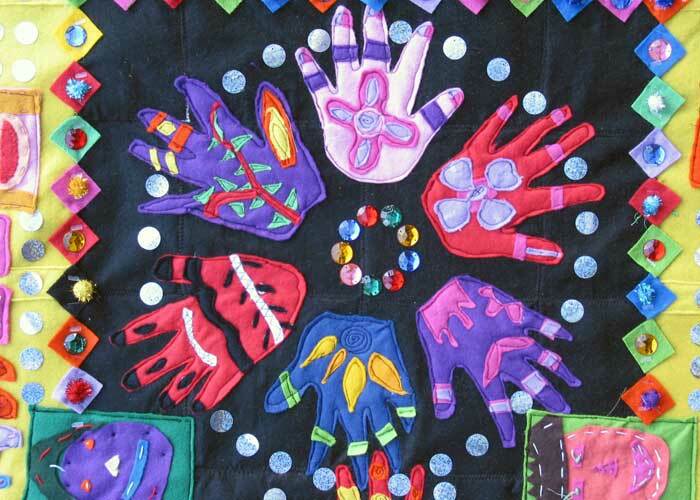 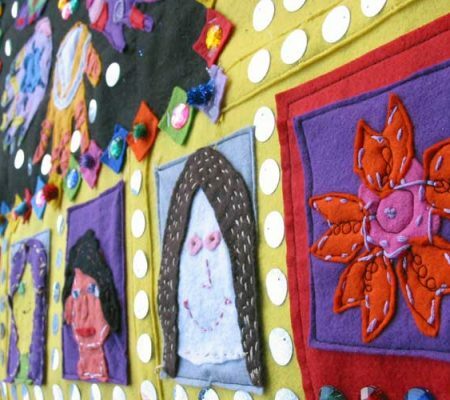 I delivered a number of participatory workshops in school teaching the pupils the art of hand stitching where they created portraits of their Indian counterparts and hand stitched felt hands with patterns inspired by Mehndi patterns. 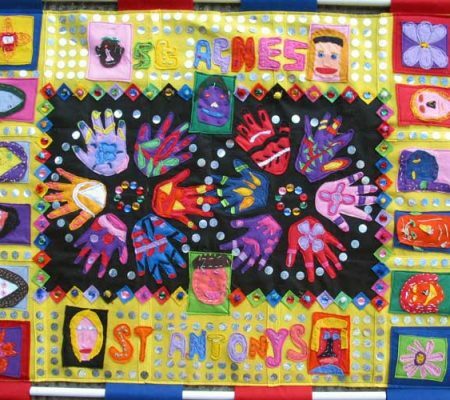 The completed wall hanging is displayed at the school entrance to remind pupils, staff and parents of their links with a school and community in India. 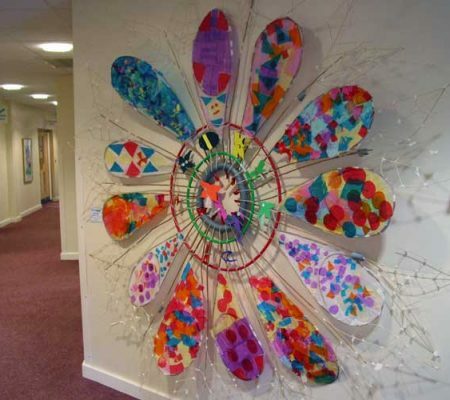 A primary school textile and mixed media art project for Springbrook school who commissioned me to work with all the year 4 and 5 pupils during Artweek to create a large scale installation for the front entrance of the school. 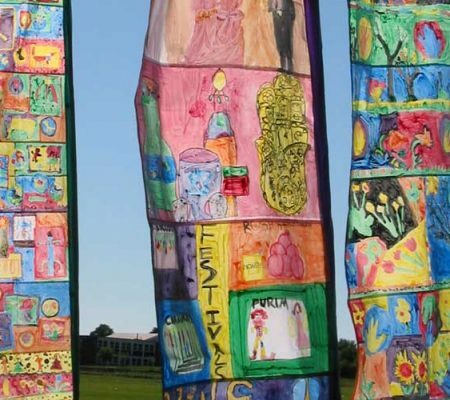 This was a great opportunity to show how primary aged children can think on a grand scale and achieve stunning results in just 2 days. 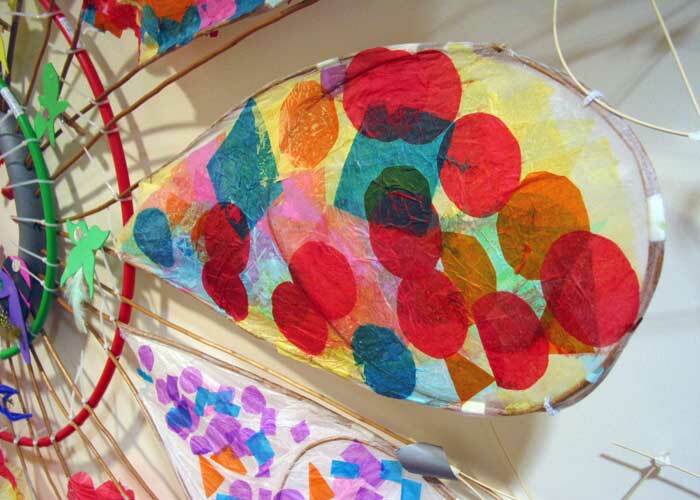 The workshops involved withy sculpture and collage and involved over 100 children. 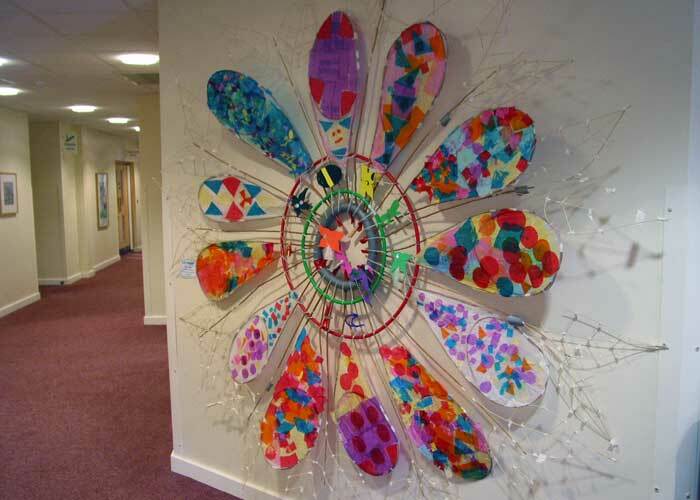 The floral artwork celebrating the local biodiversity took pride of place at the entrance to the school and demonstrates the schools links with the local community. 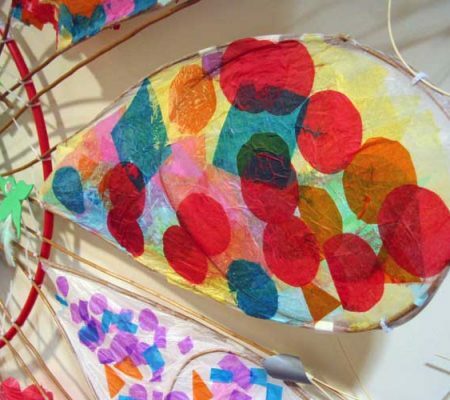 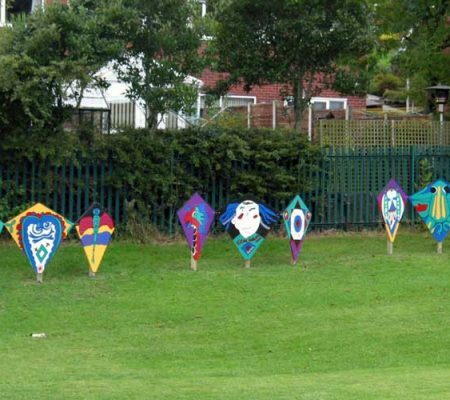 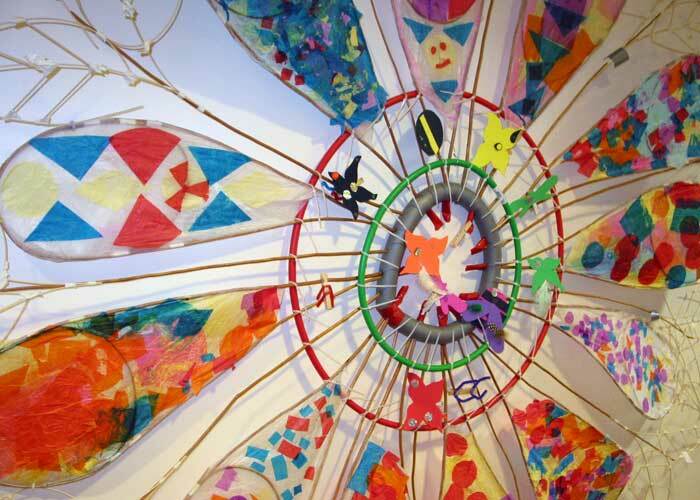 A primary school kite design and installation project for Oldham LEA who commissioned me to work with year 3 pupils on a project to help the transition from Nursery school. 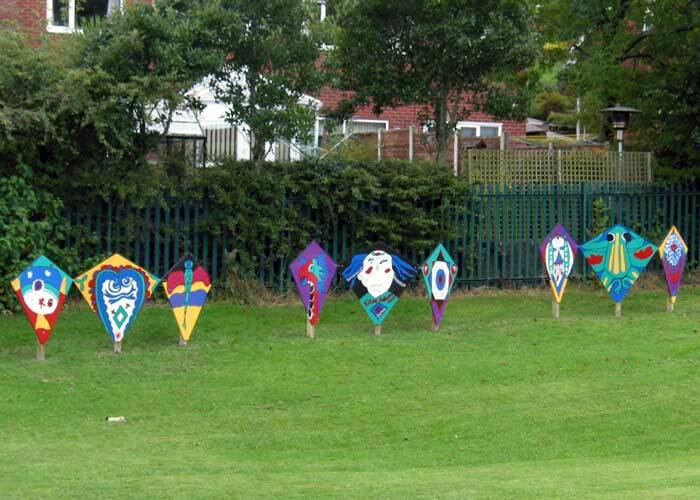 We explored kites from around the world, learnt the science behind what makes them fly, and made kites to fly on the school fields. 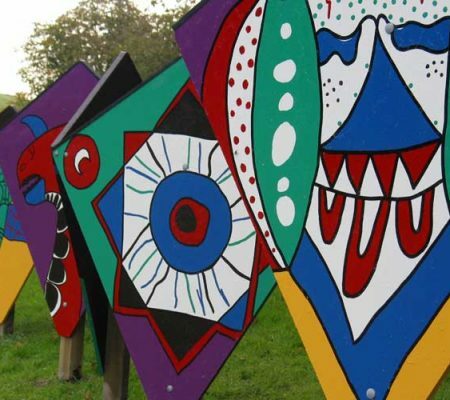 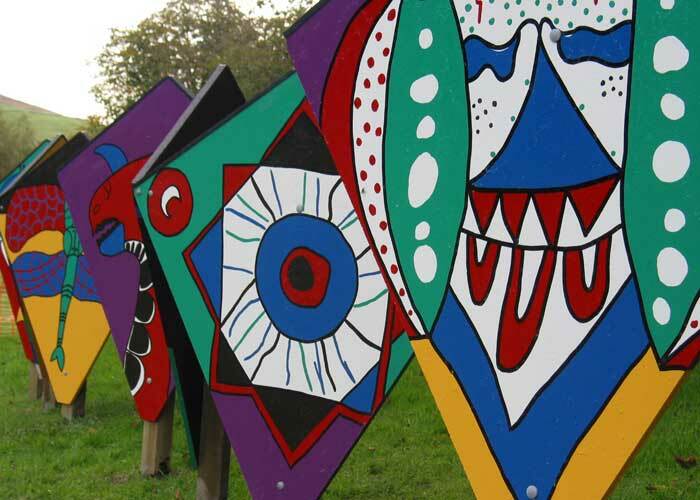 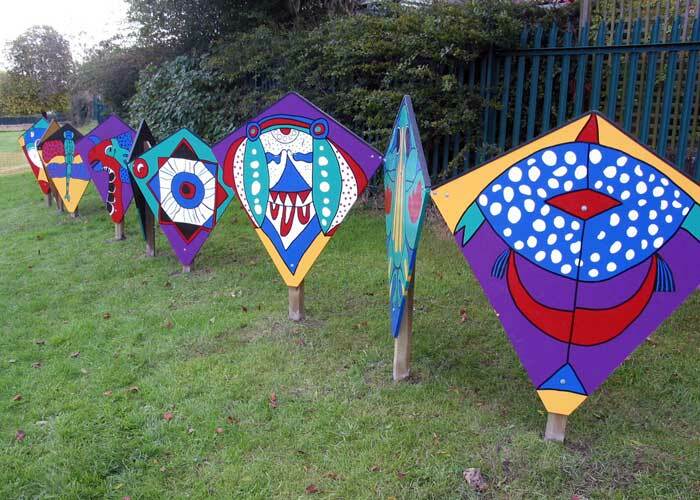 I translated the pupils kite designs onto wood panels and installed them outdoors for the pupils to interact with during break and the teachers to use as a teaching tool during lessons. 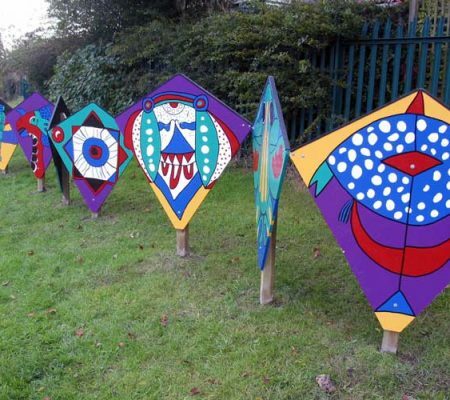 There is an installation at both the nursery and primary schools offering the pupils a familiar sights to help ease the transition between schools. 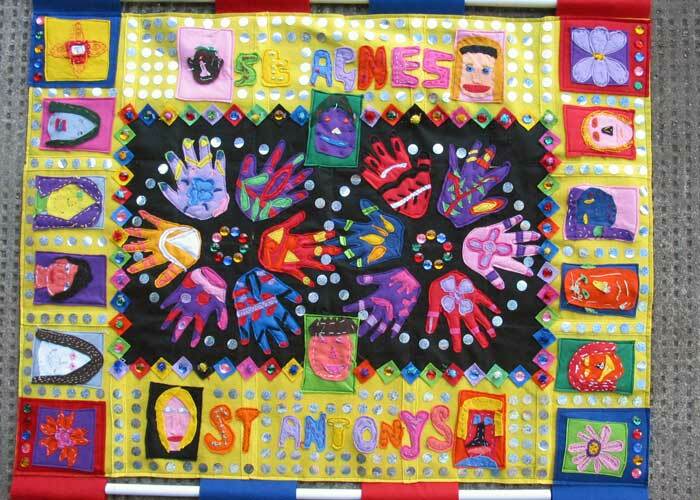 A primary school textile banner and flag making project for Oldham LEA who commissioned me to work with year 4, 5 and 6 pupils within a cluster of primary schools to design and hand paint a series of large-scale banners to celebrate the diversity within Oldham’s schools and communities. 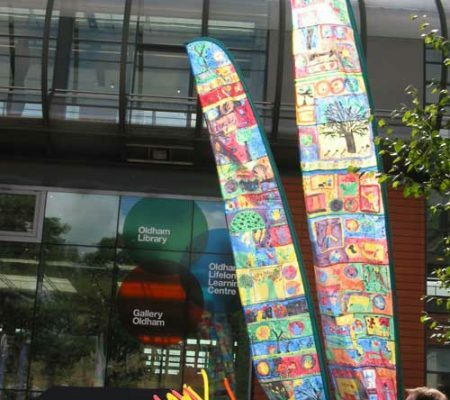 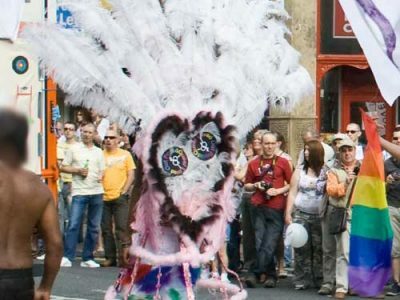 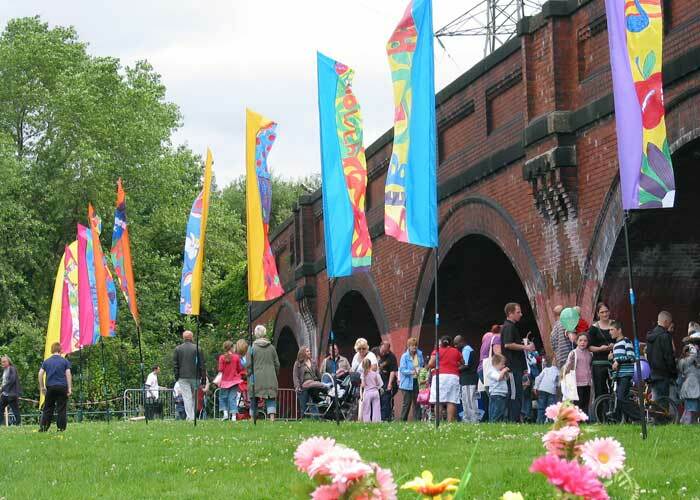 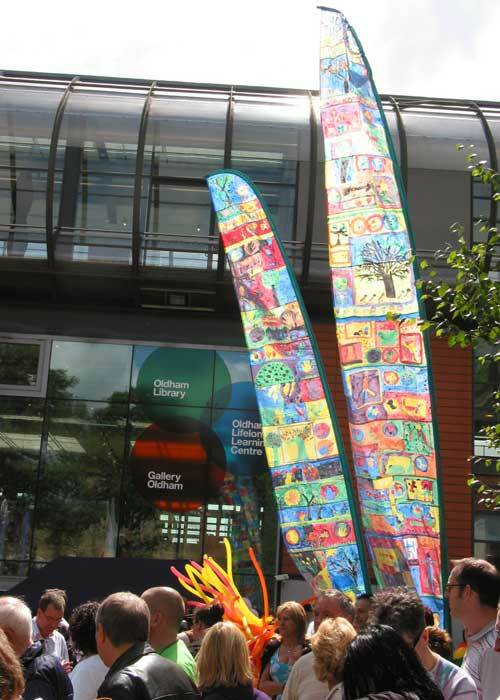 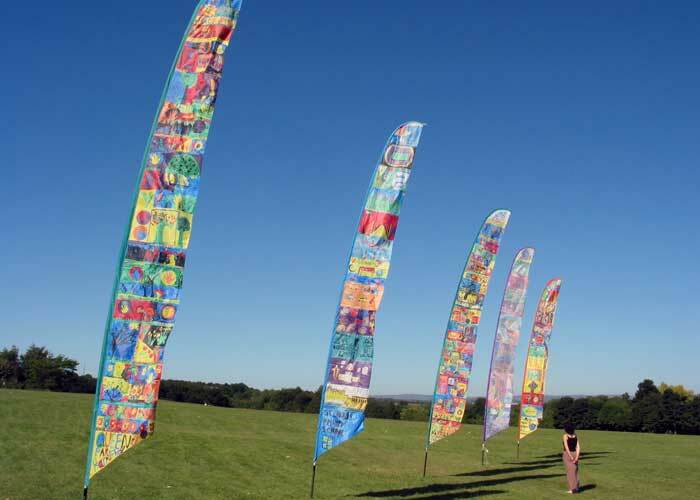 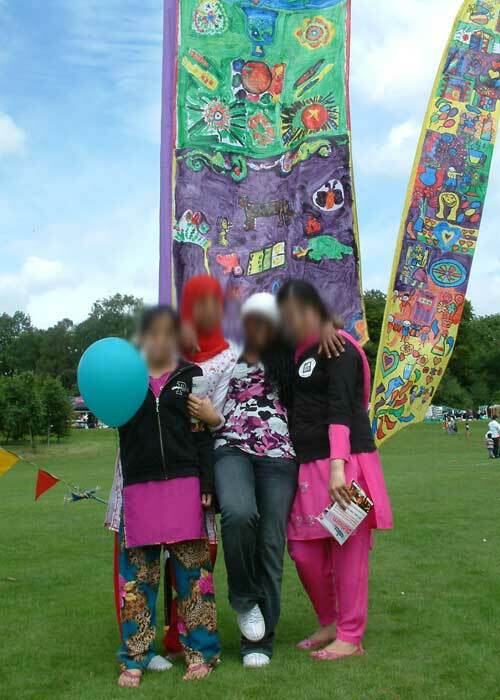 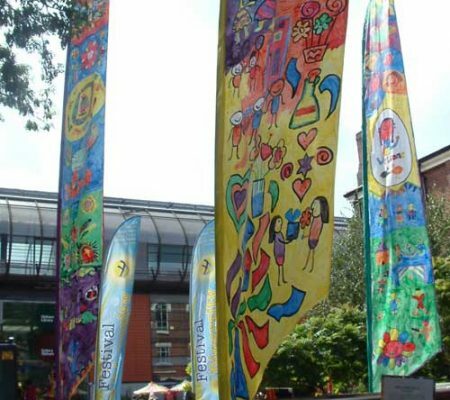 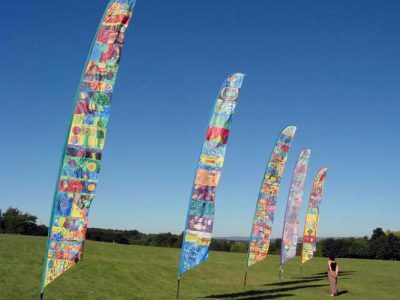 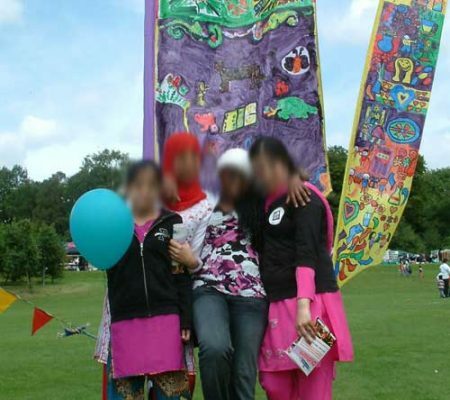 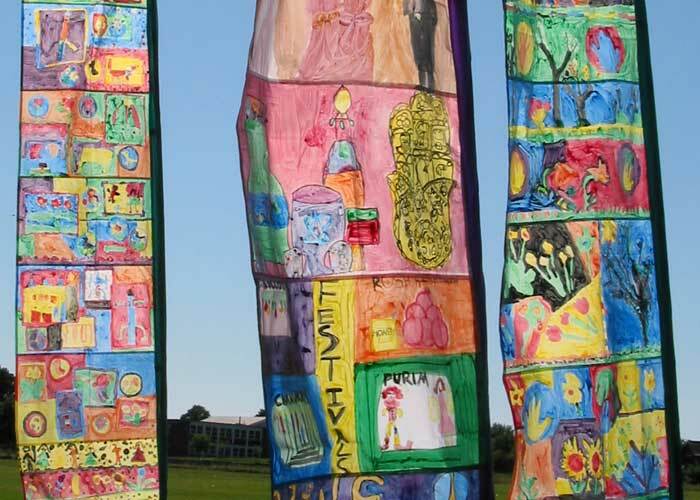 The completed banners where displayed within each school and used at a variety of community festivals and events for a number of years that included the Festival of Diversity, Oldham Mela and Oldham Pride. 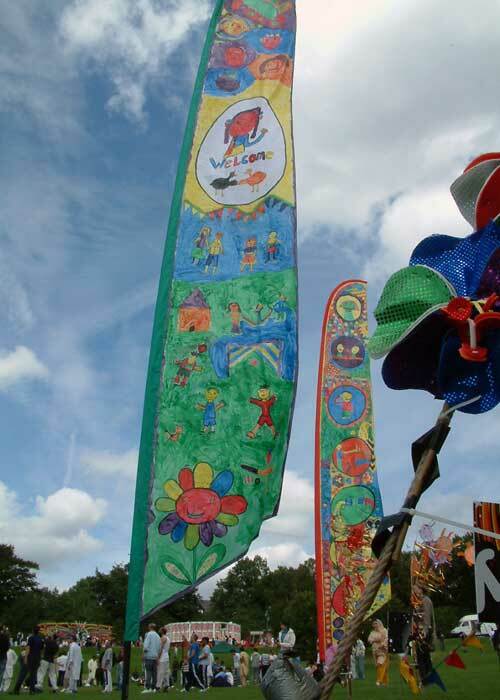 A community flag making project with children and families for Friends of Plattfields who commissioned me to engage community festival goers with the task of creating a growing forest of flags during the 2 day community festival. 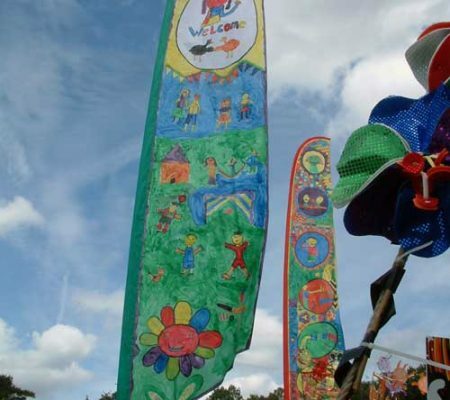 I set up a pop up flag making workshop and worked with participating families and independent children up to the age of 14 to make reverse applique flags. 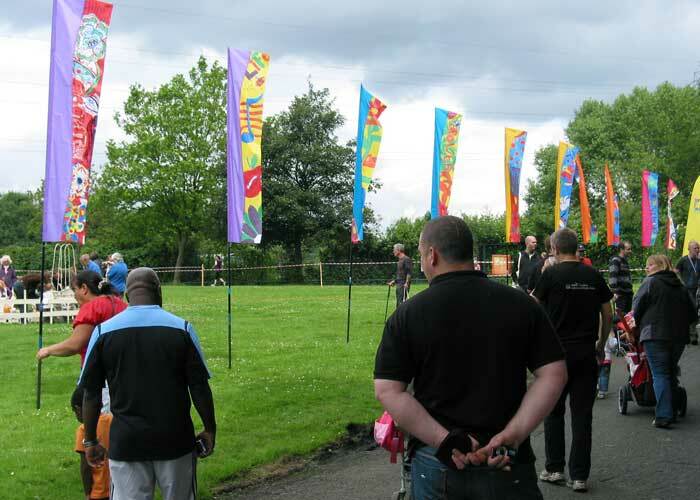 The flags were added to our forest which proved to be a popular place for picnics and play throughout the 2 day community festival. 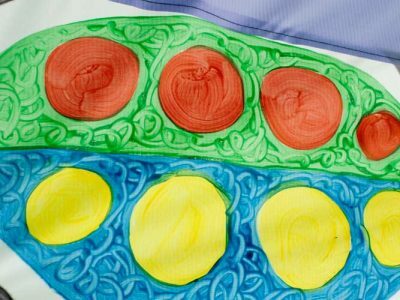 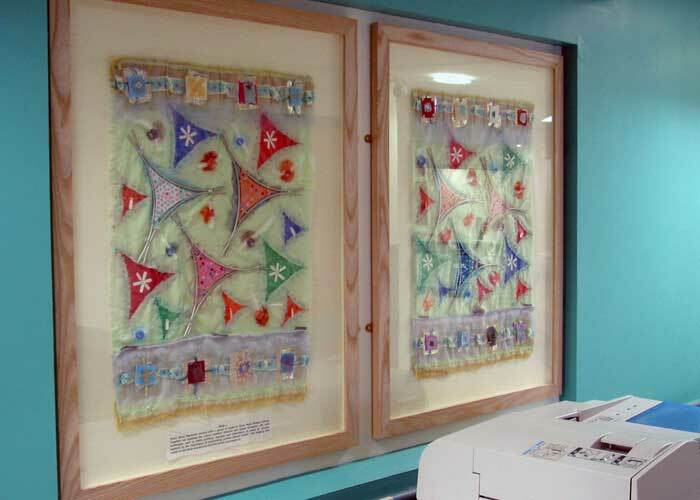 A primary school and specialist secondary school project for Stepping Hill Hospital who selected me along with several other artists to create a series of textile embroidered art works for a new building at Stepping Hill Hospital. 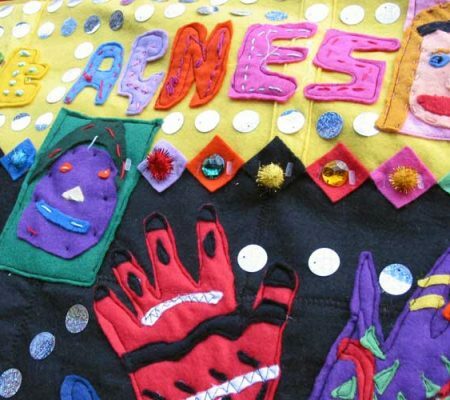 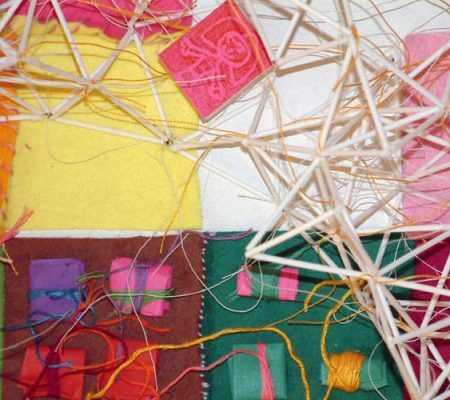 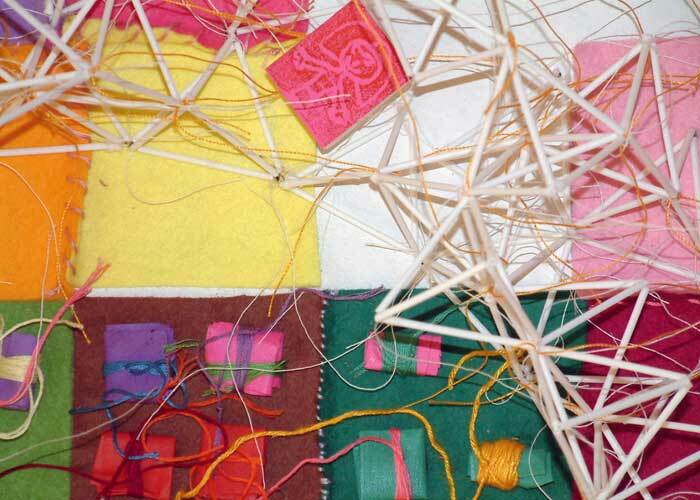 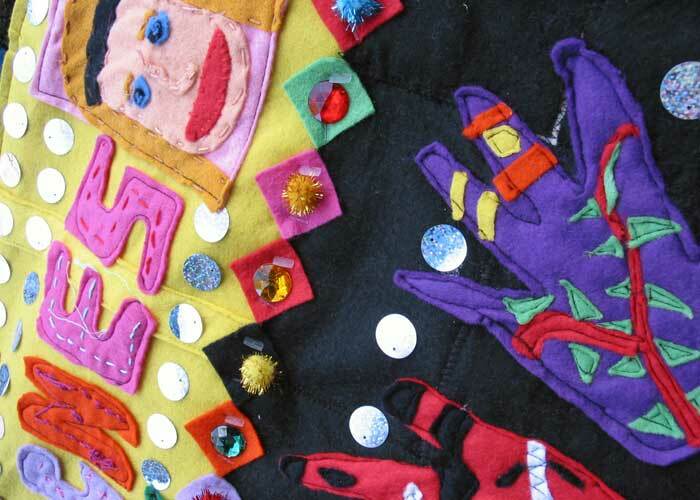 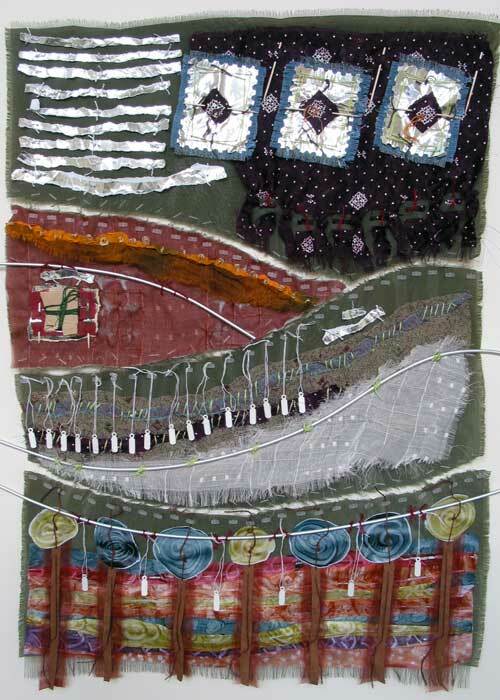 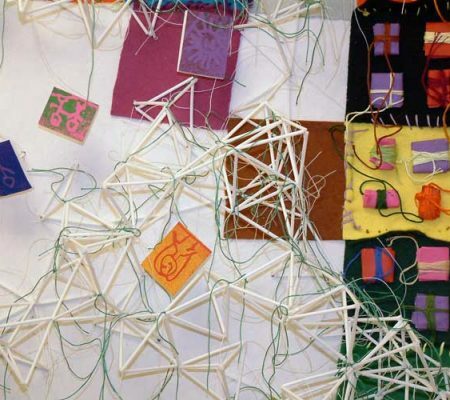 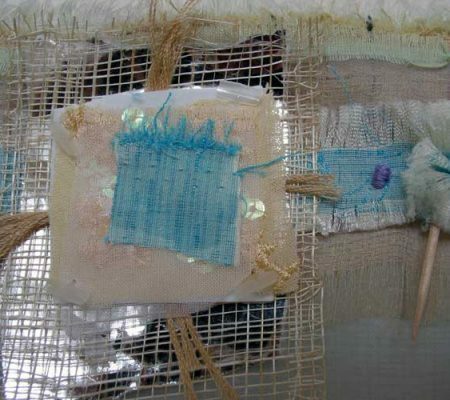 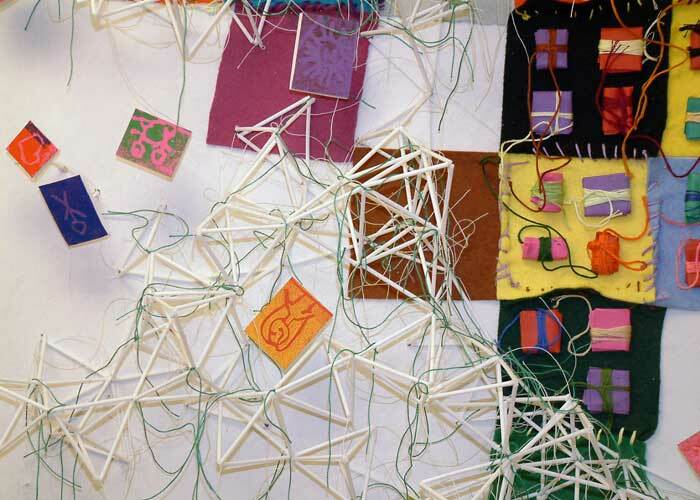 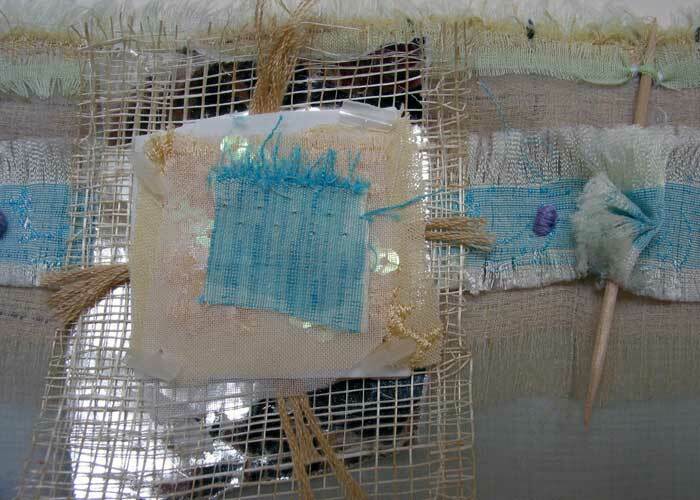 I worked with 3 schools and colleges within the local community to create elements of the creative mixed media textile art works during participatory workshops. 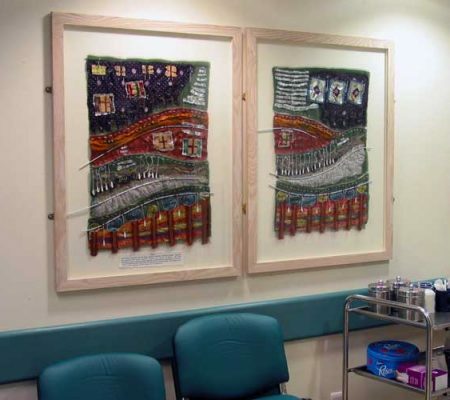 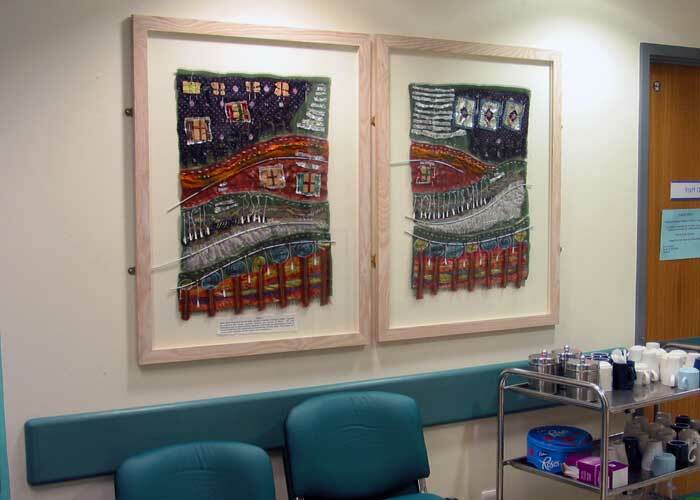 I incorporated their work into the final textile art works that were then framed and installed as part of the new hospital building. 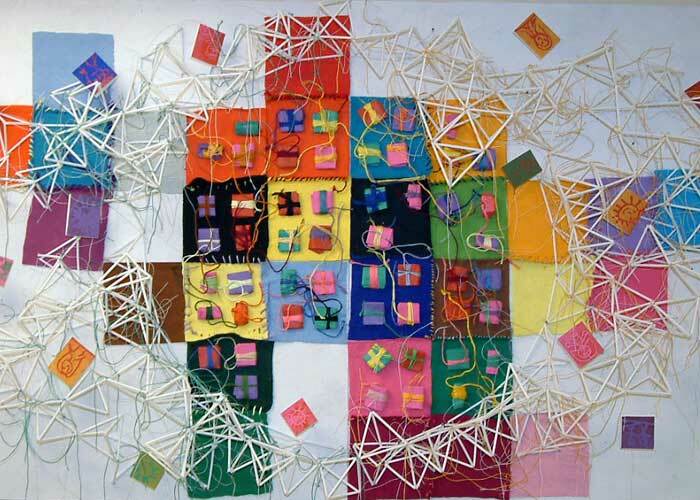 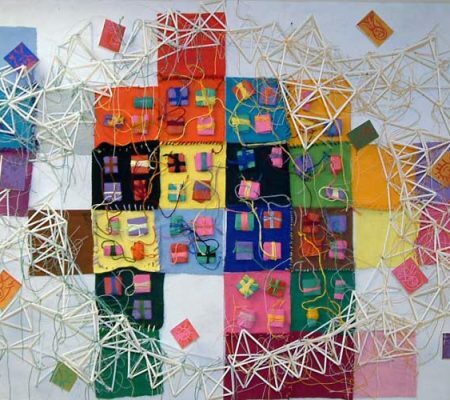 A secondary school textile inspired project for Bolton at Home who commissioned me to run several participatory workshops at a secondary school and community centre to facilitate greater understanding and co-operation between different members of the community. 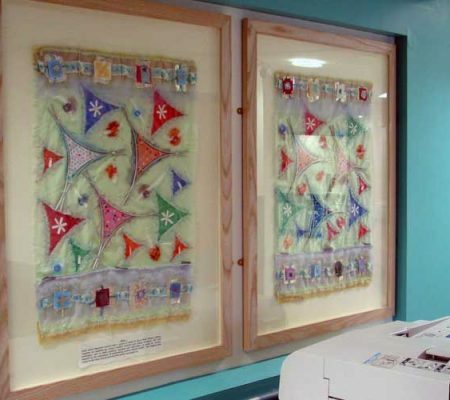 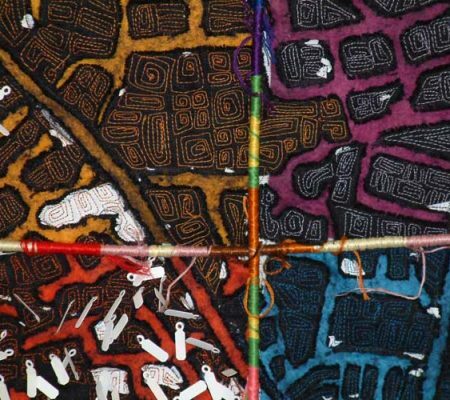 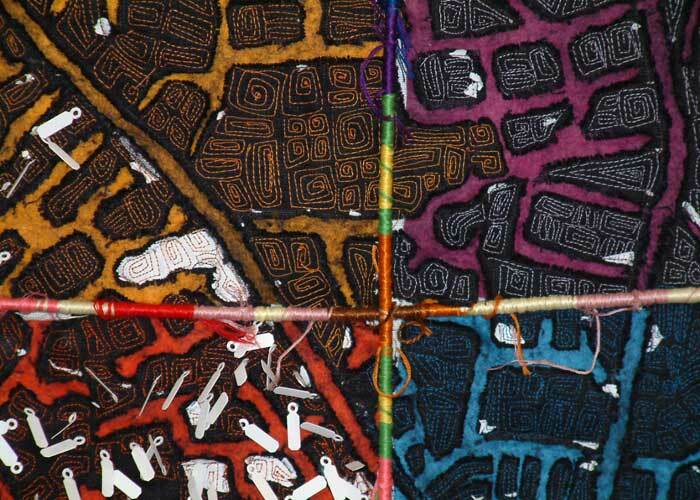 The art works they created was incorporated into a mixed media creative textiles artwork and installed in the shared community centre. 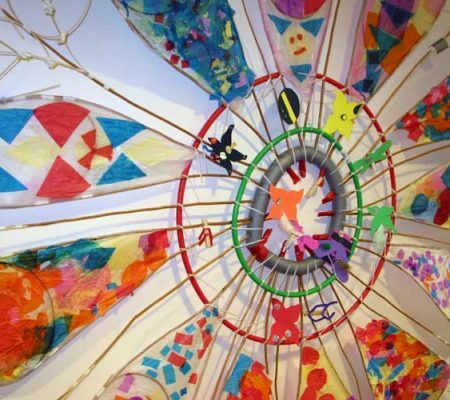 It is hoped that seeing their creative artwork come together will stimulate greater understanding and cooperation within the community.